A worker directs the hauling of soil out of the excavation site by the LA Metro at Wilshire and Ogden. The excavation by the LA Metro is at the corner of Wilshire and Ogden, and will eventually delve 75 feet down. 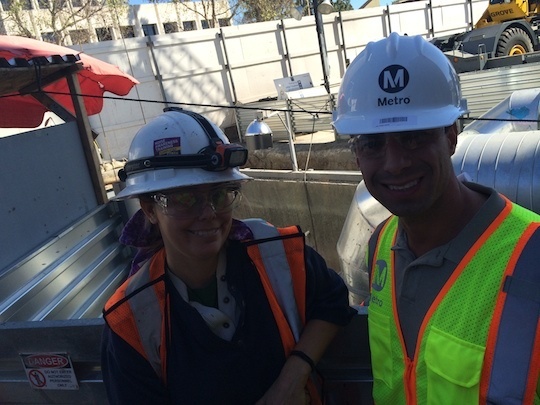 A Martinez and Kim Scott (l), on-site archaeologist and paleontologist for the LA Metro. 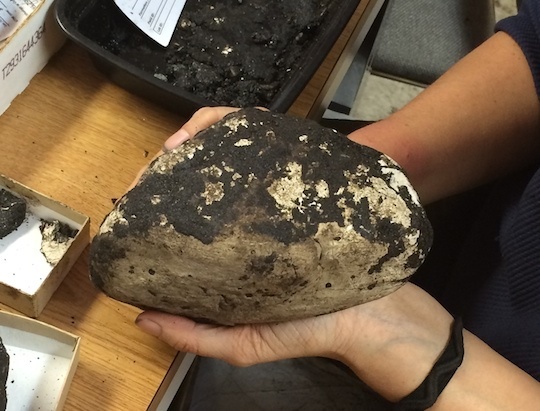 A geoduck clam, caked in dirt, unearthed at the excavation site by the LA Metro. Kim Scott displays what's believed to be either the skull or jaw of a sea lion skull. It may be two million years or more old. The same sea lion skull, but flipped over. If it were discovered this way, Kim Scott says she might not have realized the find. Kim Scott displays a pine seed and, right in front of us, pops it open to reveal an ancient pine nut. A piece of ancient wood freshly excavated by the LA Metro. It's so fragile that Kim Scott demonstrates that she can leave in indentation in the wood with her fingernail. 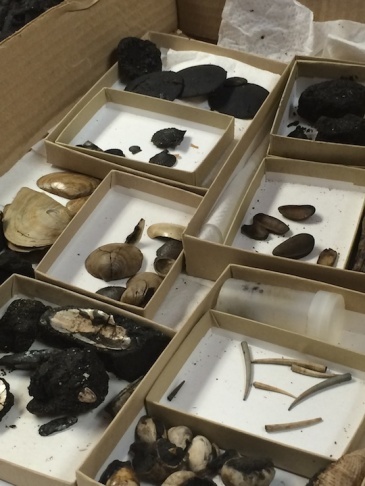 An assortment of the marine fossils discovered by the LA Metro at the dig site at Wilshire and Ogden. The LA Metro's extension of the Purple Line won't just extend out to Westwood some day -- it also reaches hundreds of thousands of years into Southern California's past. Right across the street from LACMA, construction workers are in the first stages of creating a new Metro station. They're digging 75 feel into the ground to test the soil and plan out what's possible to build. 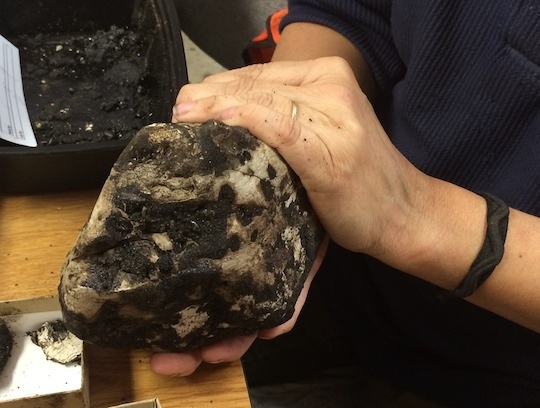 At that depth, they're finding fossils from about 300,000 years ago -- much older than the artifacts found across the street at a shallower depth near the La Brea tar pits. These fossils tell an interesting story because these are marine fossils -- including what could be a sea lion skull millions of years old. That means Los Angeles used to be completely covered in the ocean. Also, there are indications that the climate was once as cool as northern California. 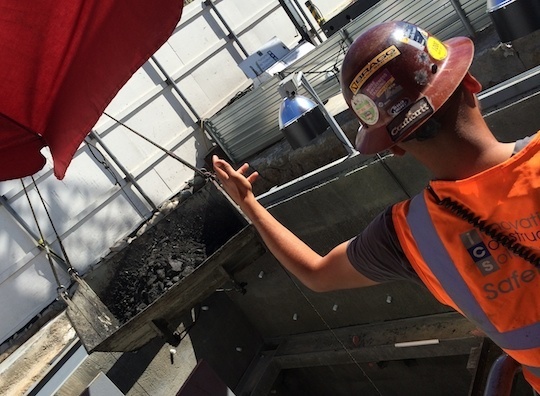 Earlier this week, A Martinez took a trip to the corner of Wilshire and Ogden to the edge of the hole they're digging ... about as wide as a backyard swimming pool and met with the Metro's on-site paleontologist Kim Scott. Marine fossils by LACMA? Huh? "The beach used to be here. In fact, the beach used to be as far inland as Arizona and New Mexico. California has a huge geologic history, and much of that history is history of the ocean. We see that a lot in the building up of California, and it's not until you get into the last 60 million years or so that most of California started creeping up out of the ocean." What kind of marine fossils are they finding? "Adorable little sand dollars. Geoducks -- it's a cool water clam, which tells us the water is cold such as you'd see in northern California, Oregon, Washington, Puget Sound, actually. Clams and snails. We've also got Monterey Cypress cones, which tells us the climate here was much like what you'd see in Carmel and the Monterey Peninsula, today." How is this different than what's been found across the street at the La Brea tar pits? "At the La Brea tar pits, all their fossils range from about 10,000 to 45,000 years old. 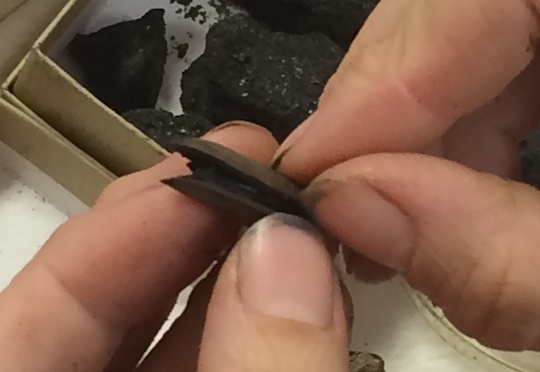 The stuff we're finding here, we have found the older stuff which ranges from about 50,000 to 300,000 years old." If there's so much interesting stuff to find, why not dig it all up? "You don't want to rip up everything out of the ground because a century from now, two centuries from now, what happens is you have more knowledge and you have more technology. You can do much more with what you find, and we're always building on science that way." What happens to these fossils? 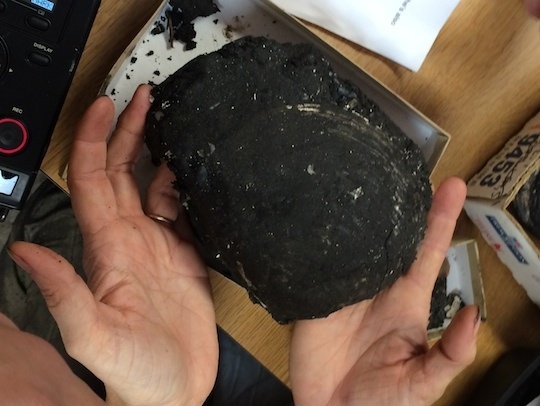 "These are all going to get cleaned up to the point of preservation and identified. And then they're going to be transferred to the Natural History Museum of LA County. 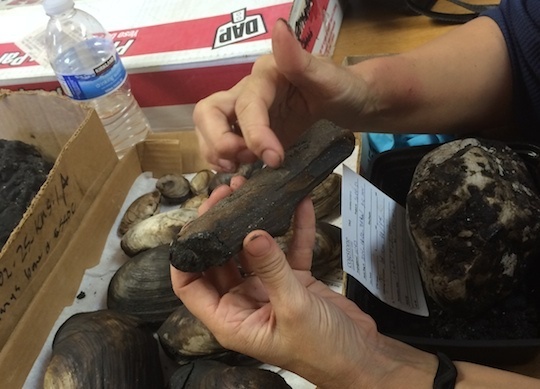 When and if we find La Brea-style deposits, that will go across the street to Rancho La Brea." 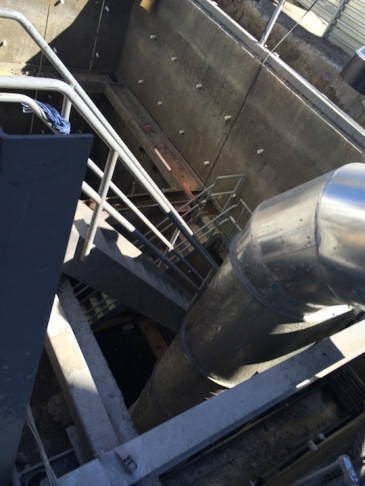 The Source: "Photos of the exploratory shaft being dug in preparation of Purple Line Extension construction"